Why does evil exist in the world and what are its underlying causes? Why are people capable of doing horrible and atrocious things? Are they to be blamed for their actions? Are they morally responsible for their deeds? Is there a potential solution or treatment for evil people? These are some of the questions that religion, philosophy, and psychology have approached via different means and avenues. In religion, evil is often blamed on malicious demons that cause otherwise decent human beings to stray from the good path. Philosophy speculates about the potential consequences of evil and is generally more interested in philosophical analysis and purposes, such as debunking religion with the quintessential “problem of evil.” Ancient philosophers like Socrates blame the existence of evil on ignorance or lack of knowledge about one's own personal connection to the truth. Psychology, on the other hand, has different modes and means at its disposal. Psychologists can undertake experiments, brain scans and base their observations on character and case studies. But even within psychology there is a way of evading the question, especially when it is claimed that certain psychological disorders ought to be blamed for evil. Would that preclude the option that there are “normal” (a very vague and ill-defined term anyhow) individuals out there knowingly causing harm and suffering to others? And why would they do so? Simply because they are evil? And why are they so? Are they born with their “dark passenger,” to quote TV serial killer Dexter Morgan? Does evil have a genetic basis? Or is it something that is shaped and influenced by experiences and one's social environment? Renowned psychologist Simon Baron-Cohen (and incidental cousin of “Borat”) approaches the existence of evil by focusing not entirely on psychological malfunctions, but on the matter of empathy, or rather lack thereof that makes people incapable of connecting with their own feelings and the suffering of others. As such, it is possible that even a person who is psychologically sound may cause pain or even kill another human being because of a complete lack of empathy. I must say that I completely agree with this view. It is one thing to say that people have a dark side to them, but it is another to actually carry out evil deeds. In fact, when we commit acts of cruelty, ranging from “mild” forms, such as making fun of others, Schadenfreude or hurting them with sarcastic comments, to more serious forms of cruelty, such as bullying, verbally or physically abusing people or torturing animals, we shut off or disconnect our feelings of empathy. In all these cases, there is almost no emotional connection to the other being and hence a lack of understanding or acknowledgement of the other person's (or animal's) feelings and sensations. By not connecting with them, we are treating them as objects and may not have any feelings of remorse. Put differently, the problem of evil in terms of violence occurs mainly because we are not treating others as full and sentient beings. As Baron-Cohen shows us there are various reasons for this lack of empathy. It can be biological, as in cases of certain brain abnormalities in which the empathy circuit is lowered or even damaged; it can also be caused by traumatic experiences, such as physical or sexual abuse, particularly during childhood. Or it can be a mix of both biological and environmental elements. In fact, a lack of empathy widens the reach and range of evil and this makes it possible that good and decent people like the subjects of Milgram's shocking “shock experiment,” or ordinary college students as in Zimbardo's "prison experiment" can show and unravel their dark and aggressive nature in certain stressful environments. Thus, the dark oppressive forces of society may bring out the worst of a person in such a given situation or environment. This means that evil is allowed to exist because people either permanently lack empathy, for example, those that are psychopathic in nature or suffer from a list of personality disorders that erode their sense of empathy, or because they are regular people who switch off the empathy circuit for different reasons, such as political or ideological beliefs. These people may believe that they are doing good, the same way a soldier who kills others feels that his opponents' death is justified, and so he switches off his empathy for them. In fact, the soldier may even rationalize that his sworn enemies deserve to die, the same way certain people feel about the deaths of convicted psychopathic serial killers or of controversial political figures. What none of these “ordinary” or “normal” citizens actually realize is that they have just objectified the other; they have turned them into monsters, stripped away their humanity and with it all their human rights. At the same time, their own actions are monstrous along a similar vein. These people may justify and rationalize the killings in these particular instances and circumstances, but they have actually more in common with their aggressors than they would like to admit. To wish for a person's death or, evidently worse, to kill another human being, good or bad, is only furthering the case of a world without empathy. The problem is that morality has relative viewpoints and neither side is blameless nor entirely good or bad; they are mostly pursuing their own interests. It may become clear that I do not support war; although in some cases it may be seemingly inevitable I think it has devastating psychological effects on all, victims and victors alike. Empathy cannot survive in fields of blood and violence and that dark environment brings out and unleashes unspeakable atrocities towards our fellow humans. In other words, none of us is fully spared of evil because all of us have our temporary shut-downs and closures of the empathy path. It may happen because we are tired, preoccupied, distracted or simply unaware of the pain and hurt our comments or actions may provoke in others. We may be blinded by our hatred of another person and fail to see past our own differences to recognize them as a sentient human being. We may be angry and escalate our levels of aggression and violence with no regard to the other person's state, motivations, and feelings. By shifting the attention from evil to empathy, we are suddenly aware of a tool that we can use to combat it. For instance, we can be more mindful of our own feelings and of those of others. It indeed should come naturally because we have so-called “mirror neurons” that are triggered by simply facing and viewing the pain in others. We can start being an example of empathy to other people. We can bring up our children to be more sensitive to these issues. We can show them that bullying causes serious pain, fear, and trauma. We can help them recognize how much verbal ridicule can hurt others. 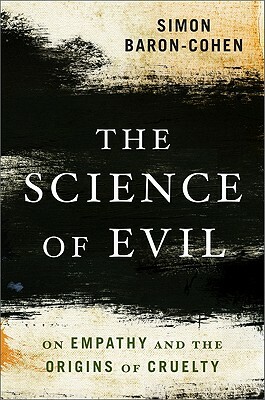 Although Simon Baron-Cohen's The Science of Evil: On Empathy and the Origins of Cruelty starts with examples of past and present existence of evil, the book soon switches its focus on empathy. Hence, my only caveat would be that its title may be slightly misleading for those who expect detailed accounts of cruelty in this otherwise excellently written and engaging book. Those who feel let down might be more interested in Dr. Michael Stone's equally brilliant show entitled Most Evil in which the forensic psychiatrist analyzes and classifies real case studies of evil and twisted people. What we get here, however, is an important, simple and often overlooked fact: Our society has become desensitized to suffering because we have lost touch with our own capabilities of empathy. Maybe our parents did not teach us; maybe it was our fellow students or teachers. But it is essential for us to realize this deficiency. It may be necessary to occasionally shut down or diminish our empathy because life would be too difficult to manage if we constantly tried to balance our own needs and those of others, but we should be aware to check and restart it so we do not lose touch with our own feelings of empathy. Some of the most interesting parts of the book are when Baron-Cohen talks about autism and Asperger syndrome, his personal field of expertise, which taught me many things about those conditions I was not previously aware of. Baron-Cohen shows that those with Asperger's are different from psychopaths in that they may not realize that their sincerely meant but socially awkward comments actually hurt the other person (“your new haircut is awful!”), whereas the psychopath may be cognitively aware of the damage he is inflicting, but it does not affect him emotionally. There are also enlightening bits on parenting and the confidence that this would imbue for the rest of their offsprings' lives. He states that parental love and trust are like an internal pot of gold that can serve their children for confronting the ups and downs of life on a secure footing. Creating an environment of trust and respecting the needs and feelings of our children will help them to perpetuate these positive experiences and project and incorporate them in their own personal lives. The most moving part comes towards the end when Baron-Cohen addresses the continuous conflict between Israel and Palestine, where there is generally a lack of empathy (and communication) between both sides. He gives a touching example where such differences are overcome, namely the charity Parents Circle for Israelis and Palestinians that encourages both sides to communicate with each other. In this case, parents who have lost their children can make free phone calls to those on the other side of the fence. By sharing their grief, they have not only taken an important step toward expressing empathy, but they have also managed to see and realize each other's shared humanity. At the same time, each part sees how senseless war and violence is and that lives are being lost and people become devastated; all this time, empathy comes a distant second to other interests, be they political, ideological, religious or economic reasons. I think this is an excellent & provocative overview; perhaps of the topic, perhaps of the book. I note that throughout you refer to evil as something between persons. Cruelty to animals is not mentioned, nor other forms of destructiveness such as wanton plundering of our ecology or natural resources. But leaving the book to one side (inevitably as I haven't read it) I think it's necessary to say that evil is a religious and not a philosophical concept. The thing which keeps it alive as a topic is its conflict with the notion of an all-powerful and beneficent God, making it seem to exist as an anti-god, i.e. devil. If we eliminate that notion of God from our view, we're able to see evil as the personification of a human reaction to something threatening, disgusting or morally intolerable: in short an emotion felt by the perceiver of evil, rather than a self-existent entity. Did Baron-Cohen not discuss such a view? Thank you, Vincent for your observations. To respond to them, I must make some clarifications first. Cruelty to animals is somewhat mentioned in the sense that it is one of the manners on how to generally spot psychopaths. Committing unnecessary acts of cruelty is a definite sign of a lack of empathy. To eat meat, however, in my own view, is not necessarily so. To destroy or pollute the environment is an act of cruelty to a degree, but since we are not dealing with a sentient being (though I do believe that nature is more alive than we are in many ways) it is hard to make a strong case here. Our laws and psychology manuals, for better or worse, do not define them so currently. As to religion, Baron-Cohen does mention it to a degree but he is very prudent and cautious. He does not openly condemn them but makes understood that many acts of cruelty and many cases of lack of empathy are directly linked to matters of religion. Just look at the Spanish Inquisition and it looks like we are dealing with psychopaths here. Their fervent beliefs make them completely blind to the sufferings of their victims through elaborately painful forms of torture. But again, I think what we term as evil is also independent of religion. If we could erase all religions in the world, evil would still exist. Religion happens to be rather good at channeling these negative forces within each of us; and I hope that all people turn on their empathy circuit and are not led astray by such radical concepts. What many often do not realize that in essence, religions would or should prefer peace and tolerance, not war on our fellow beings.